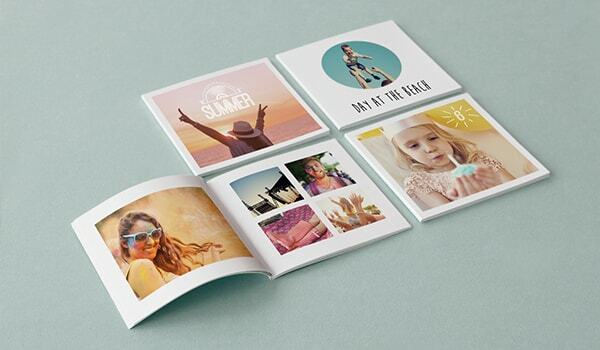 For a lightweight album with a customisable cover, create a soft cover photo book with bonusprint. Upload a cover image for that personal touch, and design an album that’s unique to you. Browse our range of sizes to get started then order yours online. There are loads of great cover options to choose from when you’re personalising a photo book. When you’re about to create a new project, you can pick from a selection of hard covers, which are available with a linen cover or a faux leather cover. Or you can create photo covers with your own images for both hard and soft cover photo albums. As well as being able to customise a soft cover with your own snaps, they’re also ideal if you want a lightweight book to flick through or to carry around with you. Printing a soft cover photo book with your own image creates a unique album that’s even more personal to you or whoever you’re gifting to. It’s so easy to add your cover image, whether you’ve picked a small square soft cover photo book or a large portrait album to show off your travel snaps. All you need to do is upload the shot you love in our creator tool then position it, resize it or rotate it until you get the look you want. You can even upload more than one image to create a montage of your favourite memories. Ready to order your soft cover photo book? With our creator tool, you can go all out adding frames, masks and clip art to your photo books. And to help you tell your story, you can also include captions and quotes. When you’re happy with your design, click ‘add to basket’. Here, you can choose to print on high-quality gloss paper if you want to give your images a luxurious finish and a greater depth of colour. Then all that’s left to do is to order your new soft cover photo book and have it delivered to your door.